While most Class A motorhomes roll out of RV manufacturing facilities with installed leveling systems, the same can’t always be said for the popular Class C motorcoaches. Perhaps it’s a matter of setting a price-point, but if you’re shopping for a Class C, leveling systems, or stabilizers, are often available as an option or can be purchased separately from an aftermarket manufacturer. Properly leveling your Class C doesn’t necessarily mean you’ll be stuck getting down on your hands and knees in the rain setting leveling boards. 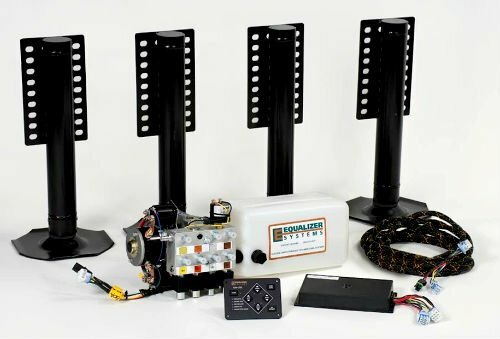 After-market leveling systems not only level your motorhome with ease, they also provide your coach with something a leveling board can’t achieve – stability. The SL series of hydraulic levelers from Equalizer Systems. If you’ve ever walked through your motorhome and felt it was more like a ship at sea, you won’t find that unwelcome pitch-and-roll effect when there are four stable “feet” planted firmly on the ground. The control panel of the IR system that mounts inside an RV. Equalizer Systems manufacturers the SL series of hydraulic levelers that feature an automatic leveling approach. 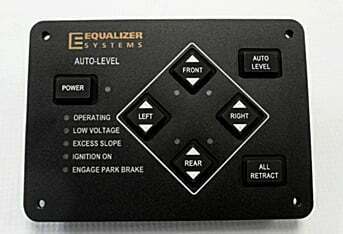 You pull your coach onto the spot of your choice, set the parking brake, and power the system up from a simple control panel inside the RV. Pressing the “auto level” button simply starts up the leveling process. Mounted under your coach are four hydraulic jacks, controlled by the system’s electronics. The electronics, which are coupled with a single hydraulic pump mounted just about anywhere in your coach, make it happen. First, the system detects what portions of your coach aren’t square with the ground and it extends the corresponding jacks down to the ground, pumping in pressure to lift the coach until it’s level. To ensure complete stability, the system extends all four of the jacks to make solid contact with terra firma. It’s a simple process and takes about two minutes. Once the system has leveled, if you feel a need to tweak it, manual override buttons on the control panel allow you to raise or lower individual jacks. When it’s time to break camp, simply power up the control panel, push the “all retract” button and the jacks are pumped back into the travel position. If you’re forgetful, don’t worry. If you start your RV, the moment you release the parking brake, the system automatically retracts the jacks for travel and you won’t “drive off” the jacks. Are Hydraulic Levelers for You? An automatic leveling system adds a lot of convenience to your RV experience. Quick camp set-up leaves you with more time for recreational activities and the added stability is a blessing. Still, you’ll need to consider all the factors. Price: For a typical Class A motorhome on a Ford chassis, a brand-new Auto-Level system will set you back a little more than $3,000 with shipping plus the cost of installation (unless you’re a serious do-it-your-selfer). Clearance: You’ll need to have enough ground clearance to keep the jacks out of trouble. Allow between 21 to 25 inches from the top of the chassis frame down to the ground. A safe rule of thumb that Equalizer Systems recommends is having a minimum of eight inches of ground clearance. 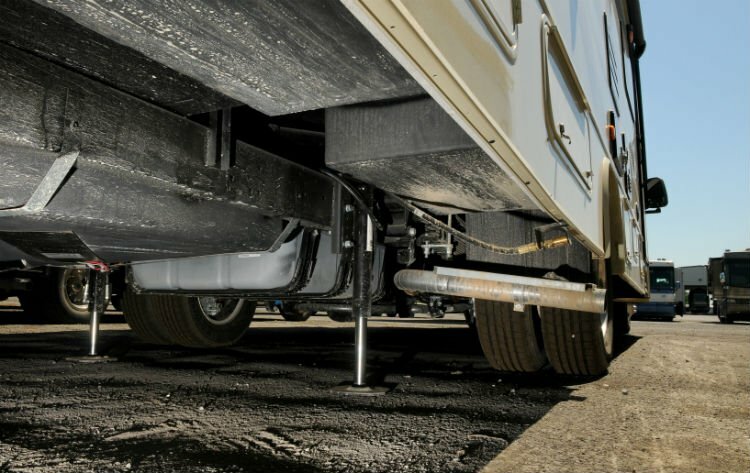 On the rear of most Class C motorhomes, this means staying within two feet behind the rear axle. 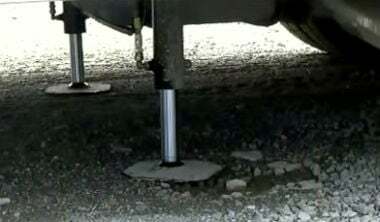 Weight: If you’re close to the gross vehicle weight limit of your coach, consider the installation of a leveler system like this will add between 150 to 175 pounds. Check your rig’s specifications closely and never push your rig over weight ratings. Allow the jacks to be between 21 to 25 inches from the top of the chassis frame down to the ground. Mounting brackets for the jacks will needed to be welded on – unless you’re installing them on a late model Jayco Redhawk, where the company provides these brackets. The rest is a lot of drilling, bolting, and running of wires and hydraulic lines. Aside from the welding aspects, all you’ll need are typical hand tools, heavy wire for getting power to the hydraulic pump, electrical fittings for the wiring, screws, wire ties, and automatic transmission fluid. But if you’re handy, it is possible to do the install yourself.